It seems to have been a very long and drawn-out process, but we now have our front driveway fully concreted across the C-shape that goes in front of our house. This is the last major item that needed to be done before we could sell the house. Now it’s just up to us to finish off the little bits and pieces to make everything perfect! The girls loved watching the workers. 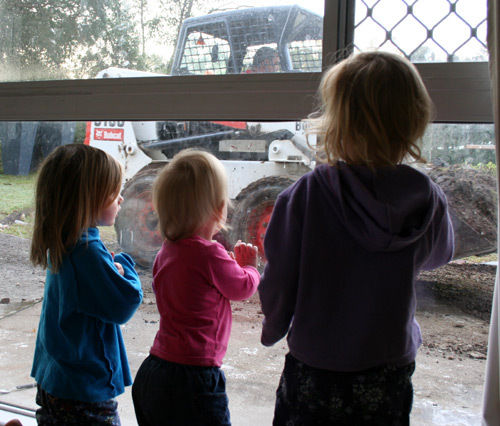 First the girls watched the progress of the Bobcat from behind the large window in the studio bedroom. We had several days of rain after the earthworks was completed, so the concreters had to wait for the ground to dry out before they could have the concrete poured and set. The girls took chairs outside to establish a front-row view of the concrete being poured. 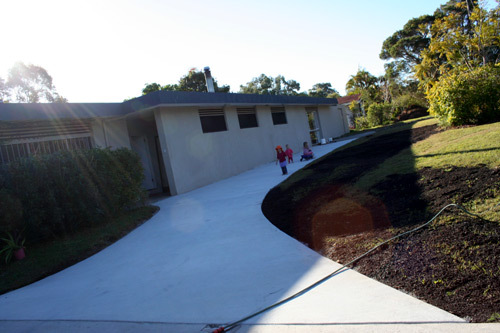 The girls soon discovered that the new driveway was great for riding their little cars. They would start at the far end and zoom all the way past the house, crashing to a stop into the garden bed. 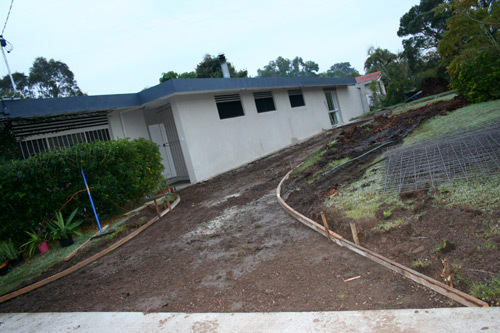 David and I had a couple of full days of work cleaning up after the concreters who left piles of concrete on the lawn and whose tyres had dug huge wheel-ruts into the soft soil.